When it comes to digital marketing, email has long been known as the channel that generates the most ROI. In fact, because studies show that email marketing ROI is $44 for every $1 spent, it has traditionally been the best area for marketers to focus on. 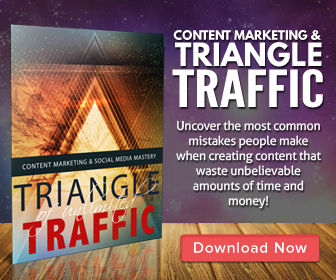 However, like any successful channel, email has become overcrowded. 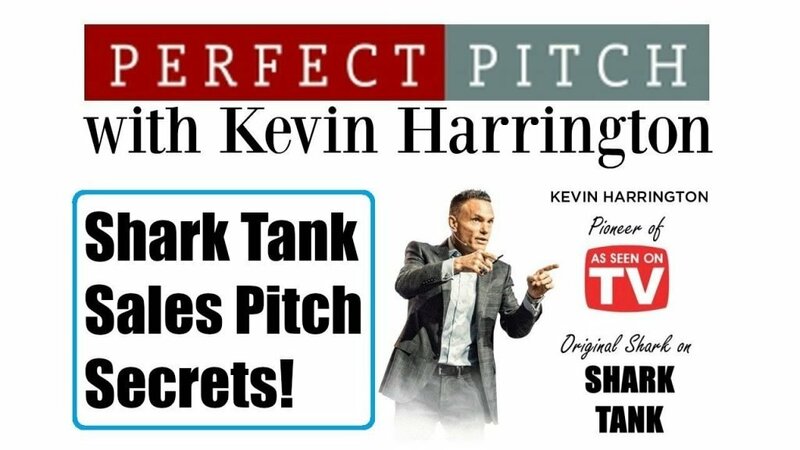 The average professional gets about 141 emails per day and the CTR of a typical marketing email is just 5-10%. Facebook, too, is changing. Once an ally of digital publishers, recent changes to its News Feed algorithm prioritized posts from family and friends over brands. These are just some of the many reasons why chatbots, or chat apps that use artificial intelligence to receive and respond to messages, are rising in popularity. 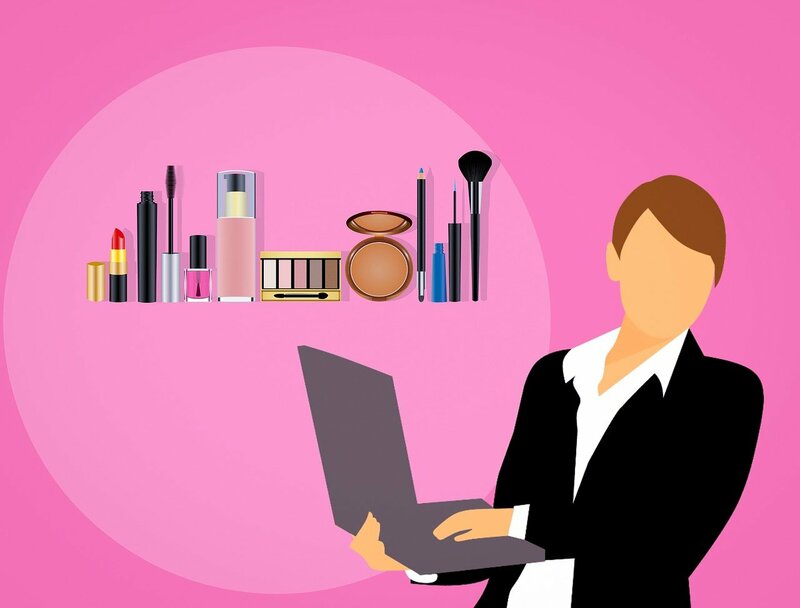 With high engagement (the typical outreach CTR of a chatbot ranges from 15-60%) and dynamic communication sequences, bots can be the first customer touch, qualify sales leads, provide support 24/7, and service multiple people at a time. And Facebook Messenger bots aren’t the only ones out there — marketers can place bots on their website, landing pages, Slack, Skype, within their apps, and more. 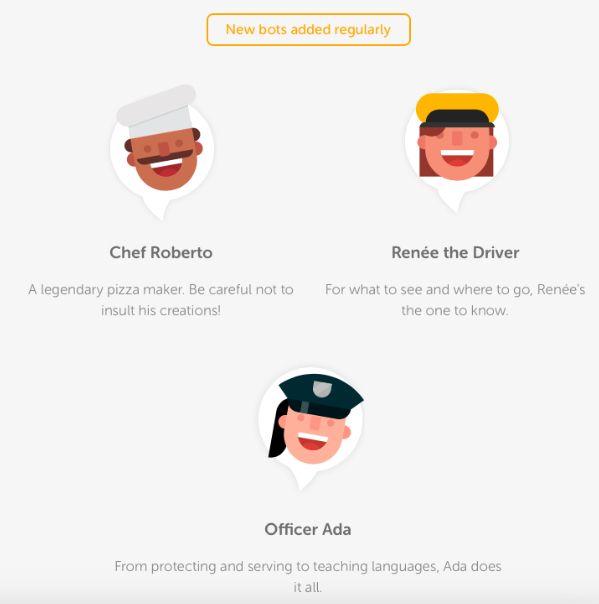 In this piece, I analyze how nine renowned brands are successfully using chatbots to reach their customers and share some tools you can use to start implementing chatbots in your own marketing funnel. Hipmunk is a platform that allows people to search for travel deals and many of its users turn to it to book flights, hotels, rental cars, or packages. To help people search and reserve more easily, Hipmunk created its “Hello chatbots” that you can easily integrate with Facebook, Slack, or Skype. The example below is from the Hipmunk Facebook Messenger Bot. The bot uses the visitor’s location to determine where they’re traveling from and then sends them great travel deals from that location. 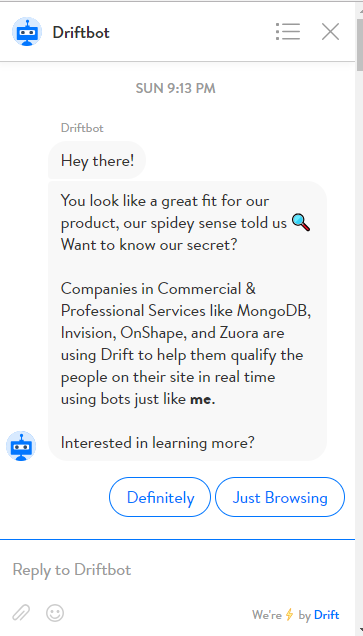 This simple, but handy chatbot takes the busy-work out of hunting for information on multiple sites, and makes it more convenient by placing it right in the Messenger app. Imagine how much easier it is to plan a trip with your friends when you’re chatting with them in one window and looking up flights on the other. Furthermore, the Hipmunk Facebook Messenger Bot uses friendly, conversational language creating a personalized, informal experience that mimics how you might speak to a human travel agent or even a friend. Internet users are used to chatting online with their friends — whether that be on Slack, Facebook Messenger, Gchat, or other channels. By using casual language and mimicking a human experience, Hipmunk successfully translates established chat mores into engagement funnels. 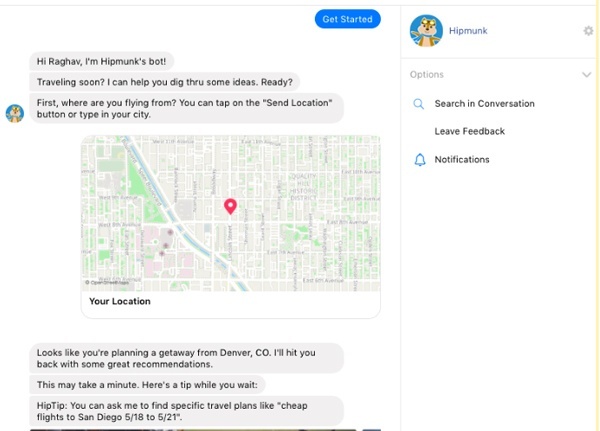 Hipmunk’s chatbot also shares maps, allowing users to ensure the bot has determined the right location, while the ‘HipTips’ use waiting time to offer new deals and show users new and optimized ways to use the app. Overall, this is a great example of a bot that is both cool and effective. According to Hipmunk’s CEO, the average user runs about 20 searches when planning a trip. By condensing the search process into one conversation and proactively reaching out to site visitors, the chatbot easily bypasses travel sites which put the onus on the user to search out deals themselves. 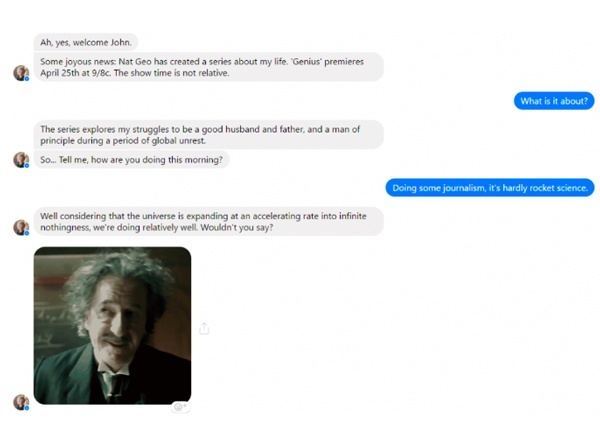 To promote National Geographic’s new TV show Genius — chronicling the lives of figures like Albert Einstein and Pablo Picasso — the show’s Facebook page showcased a Messenger bot which conversed with users from the voice of the featured Genius. This irreverent bot followed the user’s conversation, replying with information about the show and quips about relativity and other topics Einstein studied. In addition to making jokes, the Einstein bot also answered professional and personal questions. Today, the bot has generated stellar engagement, including 6 to 8-minute average conversations, 11 turns per conversation, 50% user re-engagement, and an involved community of followers. Of the available marketing channels, ‘talking to Einstein’ in real time — albeit via bot — created a conversational, human, intimate experience, as if the user were speaking to a friend. Like most great chatbots, it created the feeling of a one-to-one conversation, connecting the brand and consumer in a more intimate way. 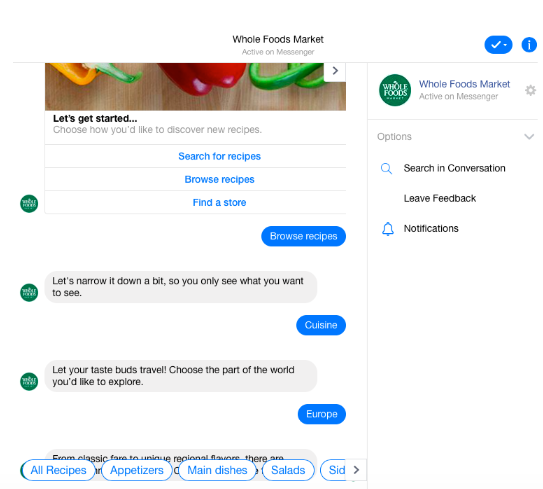 Now, it may not be Einstein, but Whole Foods’ Facebook Messenger Bot is just as exciting, connecting with users by providing recipes, products, and cooking inspiration. Presenting filters and options for different types of food, including international cuisines with each message, Whole Foods makes it easy for users to narrow in on the kind of recipe they’re looking for. Once enough filters have been selected, the bot presents a link to a specific recipe that directs users to the company’s website. Rather than rely on direct visitors, Whole Foods’ chatbot drives traffic to their site from a platform where people spend — on average — 50 minutes a day. In addition, with 60 million emojis are used on Facebook per day, the Whole Foods’ bot replicates a typical (human-to-human) messenger conversation by allowing users to shortcut their way to specific recipes using emojis. For example, if sent a pizza emoji, the bot returns a pizza recipe. Fun, right? 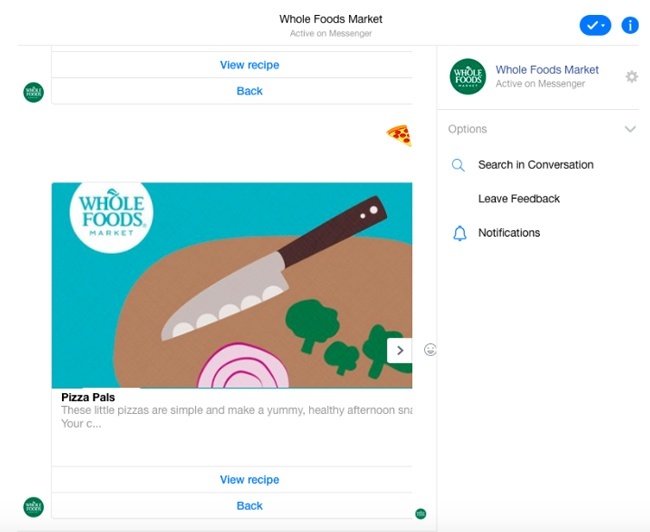 Whole Foods plans to add more advanced features in the near future, such as letting users browse and find products, deals, recipes according to specific diet plans and more, but in the meantime, we’re already impressed. The BabyCentre UK website (part of the Johnson & Johnson family of companies) is a trusted pregnancy and childcare resource in the United Kingdom. From due date calculators to articles about self-care for moms to user communities, BabyCentre puts out a lot of content geared toward all stages of motherhood and its chatbot equally delivers. 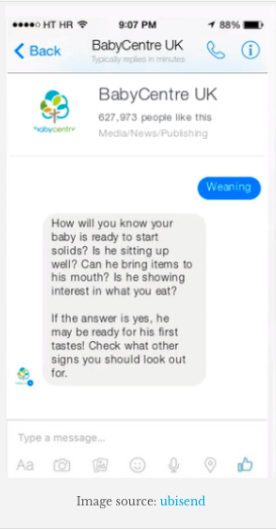 With its Facebook Messenger Bot, BabyCentreUK asks questions about the age of the child or a particular challenge the parent is facing, then suggests personalized advice and targeted content to expound on the bot’s answers. For instance, when the parent below says their child is weaning, BabyCentre offers suggestions as to when the child is ready for solid food and engages them by asking if they want to know the other signs they should look out for. Much like its Facebook Messenger Bot, BabyCentre’s email marketing is also personalized and targeted. For instance, when users sign up to BabyCenter’s email list, they’re required to input their baby’s due date so they will receive content based on the age of the baby. However, when BabyCentre tested whether its chatbot or email marketing drove more traffic to its website, the results were staggering. On average, the bot had an 84% “read” rate and a 53% CTR – 1,428% higher engagement rate than the email funnel. 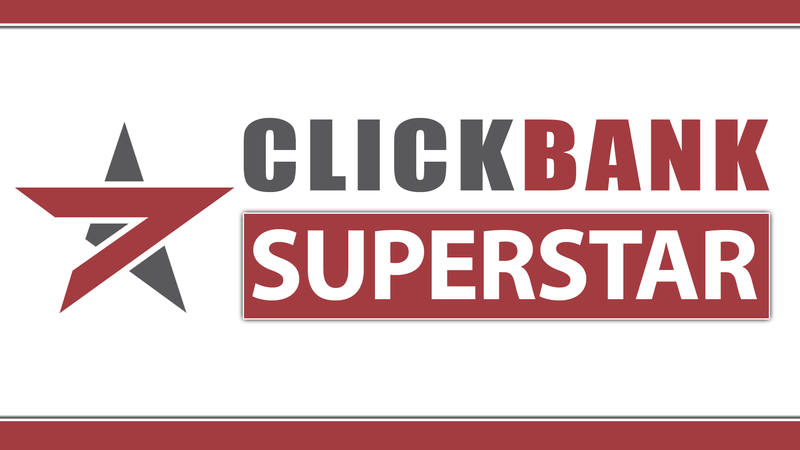 Though its email content and bot content were both super-personalized, BabyCentre’s bot avoided the spam filters and “inbox fatigue” that led to the lower email metrics. Duolingo is a popular freemium language-learning app, which gamifies practicing your new language. As anyone who’s studied another language will tell you, one of the biggest challenges is practicing out loud. If you’re learning on your own, you’re likely missing out on learning valuable conversational skills but, according to Duolingo’s co-founder and CEO Luis van Ahn, there’s actually a big fear of embarrassment when it comes to conversing with native speakers of a language you’re just starting to learn. Users requested a way to practice conversation, yet when van Ahn tried pairing language learners (e.g., an English speaker learning French and a French speaker learning English), people were afraid to talk to each other. 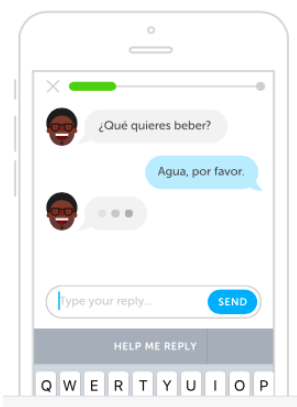 So, Duolingo built a native chatbot in its app to help users learn conversational skills and practice what they learned. Since the bot are built to be conversational and friendly, Duolingo learners can practice conversation any time of day, with any character they choose, until they feel brave enough to practice their new language with other speakers. This solved a major consumer pain point and made learning through the app a lot more fun. 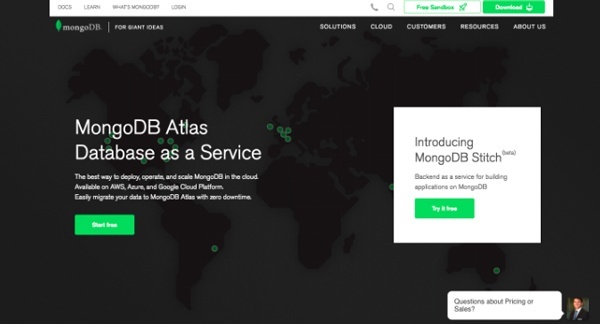 MongoDB is an open-sourced, cloud-hosted database program. To increase lead generation and qualify leads more efficiently, the company installed the messaging tool, Drift on its site. The chatbot answers prospects’ questions and drives the most qualified visitors to a sales call. The bot starts by asking site visitors if they have any questions about pricing or sales. If a visitor does engage, the bot is programmed to answer and determine if the user is a qualified lead based on their questions and responses. Qualified leads are invited to book a sales call with a rep. A calendaring integration makes it easy to reserve a spot, and a CRM integration means qualified leads are automatically routed to the right salesperson. This bot primarily helped increased conversions for MongoDB because of its efficiency. In addition to being more strategic about sales workload, leads are incredibly time-sensitive and the bot immediately responds 24/7. Research shows that 35–50% of sales go to the vendor that responds first, and the odds of making a successful contact with a lead are 100 times greater when a contact attempt occurs within 5 minutes, compared to 30 minutes after the lead was submitted. 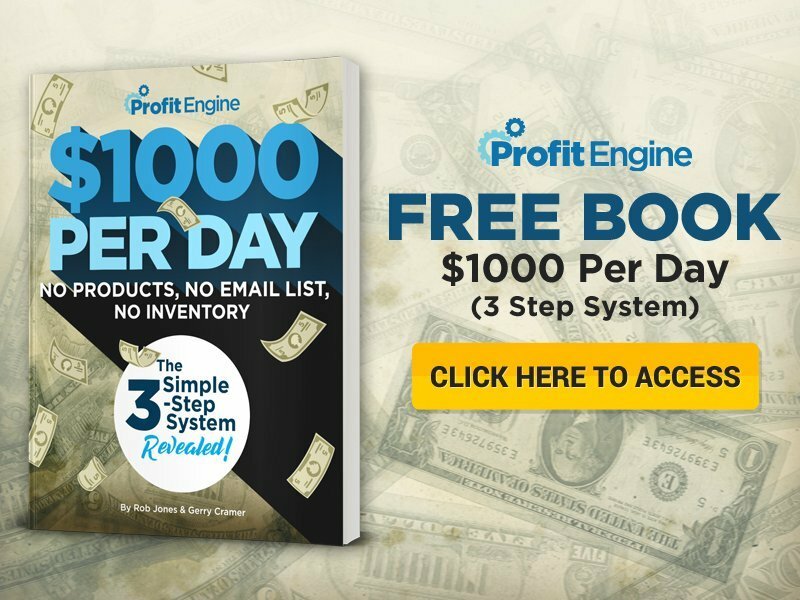 Automated qualification and immediate response time increased new leads by 70% and new opportunities by 170% in three months. 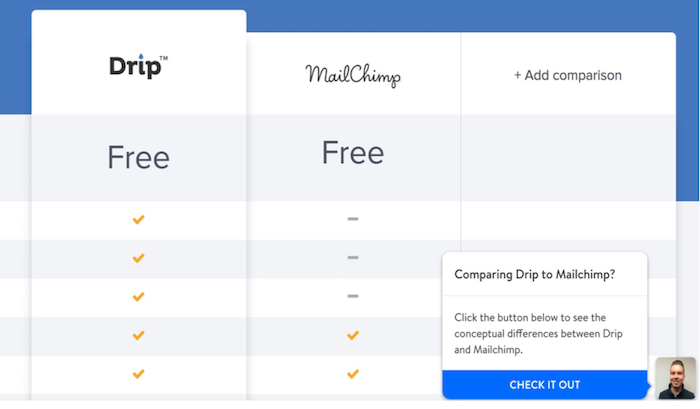 In this example, LeadPages, an industry leader in drag-and-drop landing page creation, started using Drift messaging and chatbots to convert site visitors from casual browser to a middle of funnel product comparison page. The experiment started small, with the bot popping up with a welcome message. And this minor change worked. Before the welcome message, LeadPages had 310 conversations in a month. 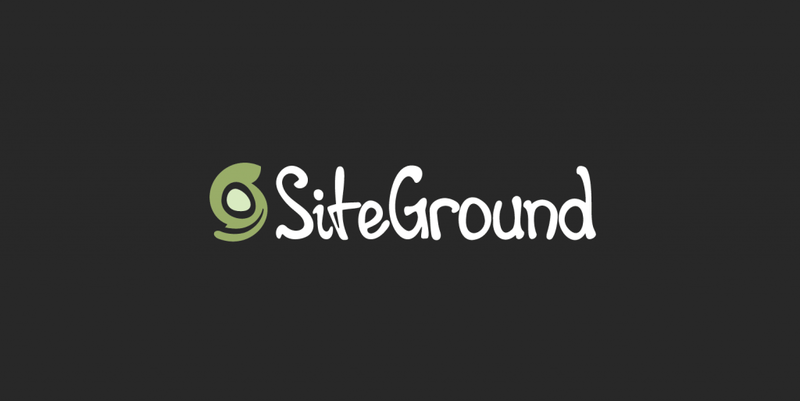 The next month, they implemented the welcome message and had 1168 conversations with site visitors. 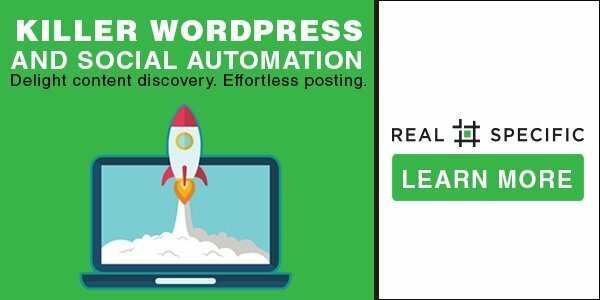 LeadPages then used Drift to set up an automated campaign that targeted users based on the page they were currently visiting. The automated messages directed visitors, dependent on their needs to a product comparison page, often the last step before purchase. Targeted messages from LeadPages’ proactive chatbots had an open rate of 30% and a 21% click-through rate to the product comparison page. 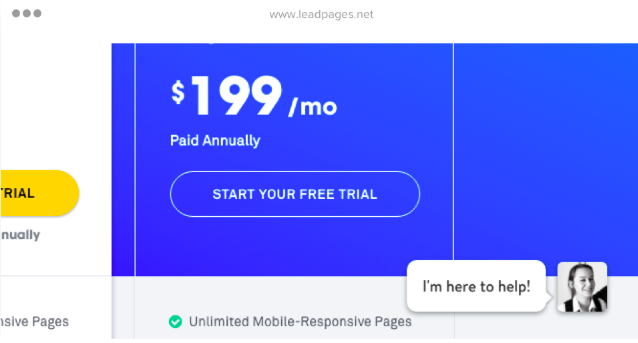 Compared to email’s 21.5% open rate and 2% click-through rate, the LeadPages chatbot won out over of the traditional medium. It provided an immediate and targeted response which navigated visitors — gently — from browsing to content that could help them evaluate LeadPages as a potential solution. 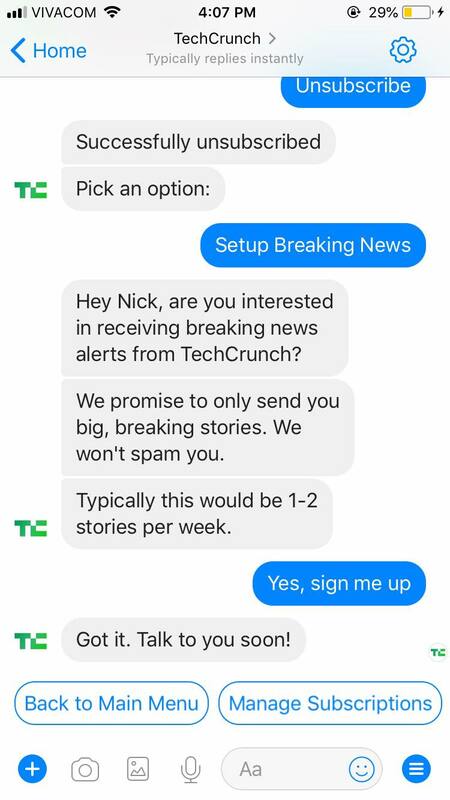 Next up, TechCrunch uses chatbots to send you the content you want, when you want. The chatbot allows you to pick the number of times you’d like to receive new content, as well as the type of content (hot stories, specific authors, etc.). What really makes it stand out, however, is that the news you get is personalized. 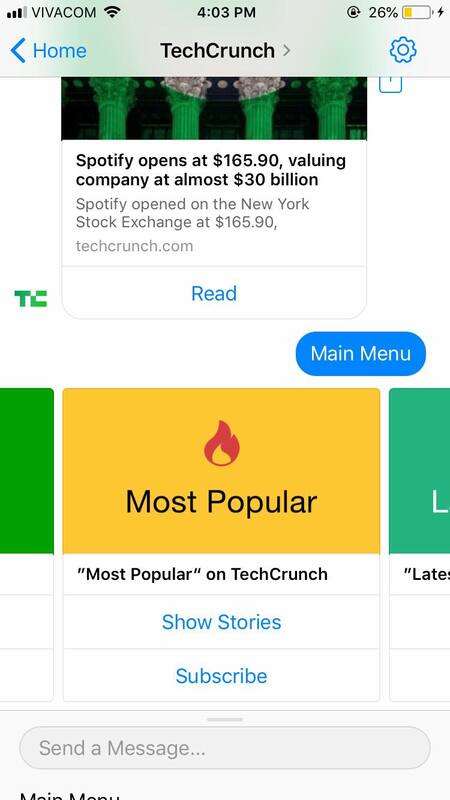 The TechCrunch bot keeps track of the types of articles you read and then serves you the type of content you’d like. You can also ask the chatbot about specific types of news that you’re interested in. With way too much content online for any one person to read, TechCrunch customizes what you receive by allowing you to dictate subjects and sending frequency, and suggesting new content. 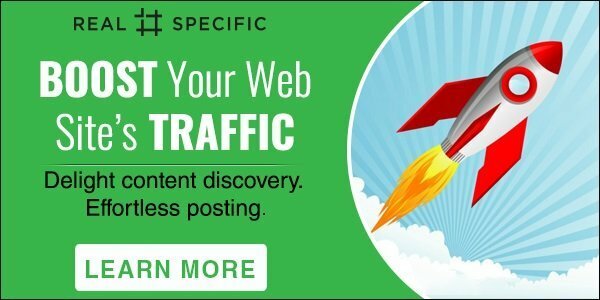 Only sending content the reader enjoys creates a positive brand association with TechCrunch and drives more engaged traffic to their site. Post-sales support is an essential part of your marketing funnel. Repeat customers tend to spend more and, if really satisfied with the service, act as your brand ambassadors. Chatbots can help ensure your customers get the best customer service. Let me explain. Most of these questions can easily be automated and wielded by a chatbot, leaving a dedicated team with more time to answer complicated questions. Amtrak is using a great example of this. Although the train seems like a less modern way to travel, Amtrak is actually one of the larger companies using chatbots to offer quick customer support. Instead of making phone calls or waiting for customer service reps to respond to emails (not ideal if you’re trying to make a train), users can talk directly to “Julie,” Amtrak’s customer service bot. It’s faster and it’s super convenient. Bots can’t solve everything, however, so Julie will also get you in touch with a real customer service support rep for questions that require human attention. Using an AI chatbot on its site, Amtrak saved $1 million in customer service expenses in a single year. The bot was able to answer over 5 million questions every year and even increase revenue by 30% through automated bookings. Now that we’ve talked about how other brands are using chatbots, you’re probably wondering where you can start. Well, that really depends on which platform is best for your business, or where your audience hangs out online. Most of the platforms we’ve mentioned provide guides, resources, and documentation on developing your very own chatbot. This, of course, can be a bit more complicated and time-consuming. If you need a very personalized chatbot solution but don’t have the development workforce to create it, try ChattyPeople. 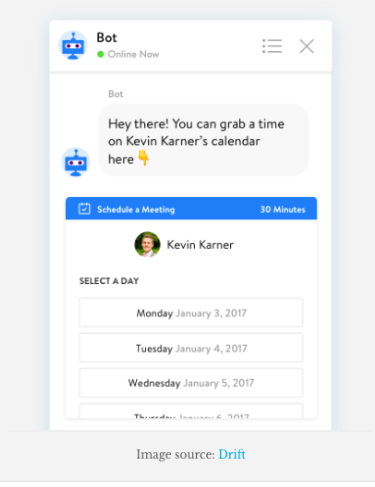 ChattyPeople helps you develop chatbots for just about any platform – Facebook, Skype, websites, Slack, and more. ChattyPeople goes beyond FAQs — it can create more sophisticated chatbot sequences that let users interact with the bot using a combination of text, voice, and more. For businesses that have products that are more advanced (e,g., language learning, educational training, etc. ), this could be an effective way to help users complete key tasks. If you’re looking to increase conversions to your site, Drift is the go-to messaging tool. While many chatbots focus on Facebook Messenger, Drift lives on your website. You can set it up in a way so the bot reacts differently to customers depending on which page they’re browsing. That way, you can start a conversation based on the prospect’s interest, creating a more personalized and targeted experience. Though many of the tools above specialize in specific platforms like Facebook, Telegram, etc., Flow XO does them all. 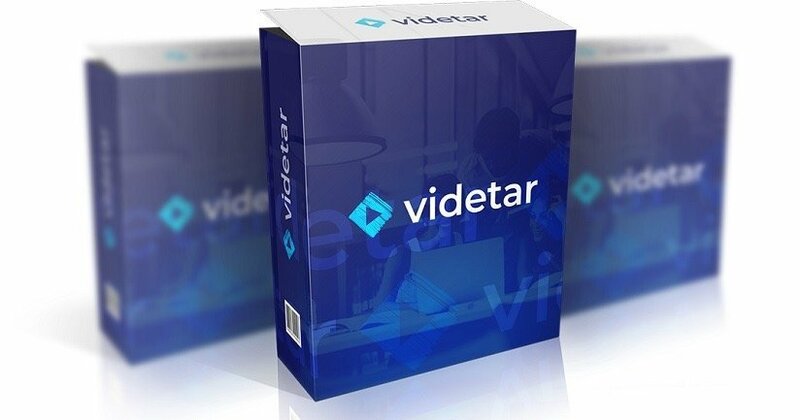 The software helps to create one chatbot through its drag-and-drop interface; that bot can be used for Facebook Messenger, Slack, Telegram, and SMS. 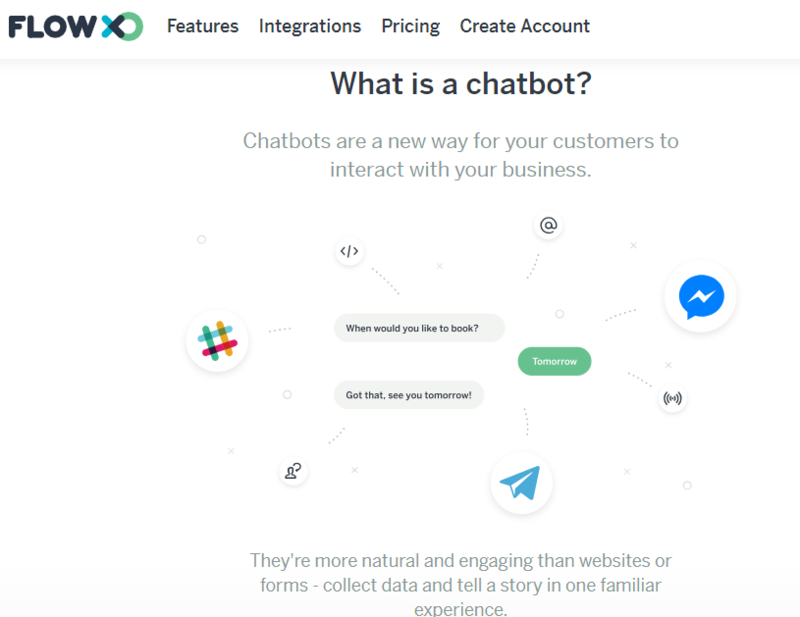 One of the biggest benefits of Flow XO is that it allows marketers to build bots without having to write code – similar to building a landing page on LeadPages or ClickFunnels. Because Flow XO operates across Messenger, Slack, Telegram, and SMS, you can build one flow and replicate it for multiple platforms. If your company communicates with customers through many different channels, Flow XO is the ideal solution. Chatbots can help improve just about every part of your marketing funnel from initial questions sales to customer support. Research shows that while only 15% of people reported interacting with a business’s chatbot this year, that number will only rise. While only 27% of consumers say they expect an instant response to an email, 75% of consumers expect an immediate response from a chatbot. Consumers also preferred chatbots over other many other marketing channels to answer questions, get 24/7 service, and receive expert advice. Successful digital marketing requires constant evolution. Implementing a chatbot, much like these nine brands did, could be how you stay one step ahead of the competition.